Microwaved Cashew Nuts. Easy snack to serve with drinks. Pour cashew nuts in a casserole. Add 2 cups of water and sugar. Cover it and microwave at ‘high’ for 6 minutes. Strain. 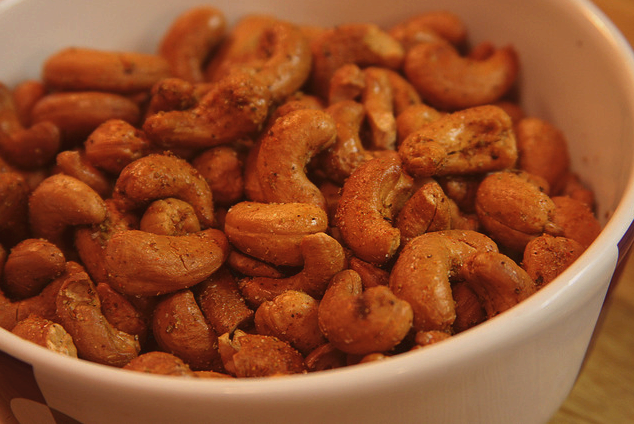 Put 1 cup of vegetable oil and cashew nuts in a heat resistant bowl. Microwave at ‘high’ for 5 minutes. Strain. Microwave at ‘high’ for 3-4 minutes or until lightly browned. Strain. Quickly add 1/2 tsp five spice powder, chilli powder and black pepper. Mix well. Microwave for another 1 minute. Allow to cool, sprinkle with salt to taste. Mix well before serving. Yummy, it looks so delicious. I never had cashew with sugar. I think this is great for my child’s this year birthday party. It looks really good and I think the best time to have it is while watching some movie. I added some garlic powder to the cashew nuts and omitted the spices. Kept in a jar. My son love it! Going to try out with almonds. Dun know if it works.